Nice Montblanc 149 in great shape. Two tones 18k nib. I would say medium stub with good flexibility wich is quite rare on this model. Montblanc 149 en excellent état. Plume or 18k, deux tons, medium stub, avec une bonne flexibilité, ce qui est assez rare sur ce modèle. This is a Montblanc 146 sterling silver barleycorn. Excellent condition except a light ding on the barrel (see pictures). Montblanc 146 Argent Massif Grain d'Orge. Très beau stylo. Excellent état excepté un léger choc sur le corps (voir photos). This is the rare version of the Parker 75 Sterling Silver "Damier". Excellent shape with normal traces of use. Version rare du Parker 75 en Argent Massif motif "Damier". Excellent état. Traces d'utilisation normales. This pen is in excellent shape. Il s'agit de la seconde version avec capuchon à carreaux. Classic Montblanc 149. The biggest of the line. Excellent Shape . No brassing. Engraved "Germany" on the clip. 14k solid gold two-tones nib. Fine size. Montlanc 149. Le plus gros de la ligne. Excellent état. Pas d'usure. Gravé "Germany" sur le clip. Plume or 14k. Taille Fine. This Montblanc 149, the biggest of the line, is in beautiful condition. It has just been revised by Montblanc (invoice). The Piston is mint, the pen has been cleaned. It is in near Mint condition. Engraved "W GERMANY" on the clip with a serial number. Ce Montblanc 149, le plus gros de la ligne, est superbe. Il vient d'être révisé par Montblanc (Facture). Le piston est neuf, le stylo a été nettoyé. On peut lire "W GERMANY" ainsi qu'un numéro de série, gravés sur le clip. La plume est en or massif 18k, deux tons. This Parker Duofold was produced in 1988. It has the engraved arrow on the clip. This is the modern version of the Parker Duofold, reminding the Parker Duofold of the 1920's. The Centennial is the biggest version. This pen is in excellent condition. Just one point of brassing on the section ring near the nib. Sold with box, overbox. Parker Duofold produit en 1988. La flèche sur le clip est gravée (elle sera en relief ensuite). Il s'agit de la version moderne du Parker Duofold, rappelant celui des année 20. Le "Centennial" est le modèle le plus gros de la série. Plume or 18 Carats bicolore. Ce stylo est en excellent état. Juste un point d'oxydation sur la bague plaquée or proche de la plume. Vendu avec boite et surboite. Porte Mine Parker Duofold marbré rouge, des années 90. 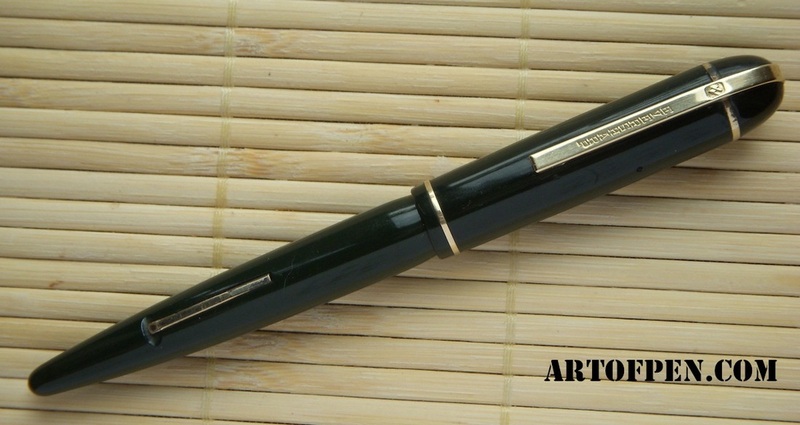 This Parker Duofold was produced in the 1990's. This pen is in excellent condition. Just one point of brassing on the section ring near the nib. Parker Duofold produit dans les années 90. Ce stylo est en excellent état. Juste un point d'oxydation sur la bague plaquée or proche de la plume. Porte Mine Parker Duofold marbré vert des années 90. This is the famous Montblanc 149. The biggest pen of the line with a beautiful two tones 18ct nib. Engraved Germany on the clip with serial number. Il s'agit du fameux Montblanc 149. Le plus grand de la série équipé d'une très belle plume à deux tons (18 carats). Excellent état. Pas d'usure des pièces plaquées or. Le clip est gravé Germany et porte un numéro de série. 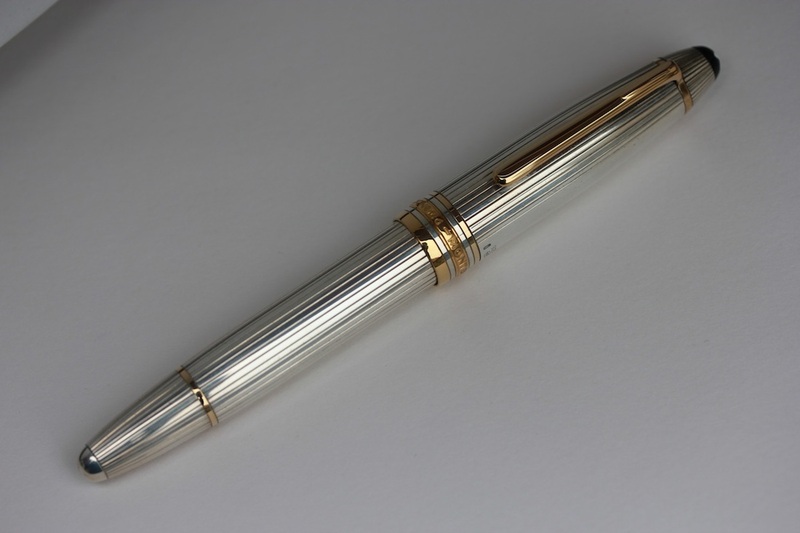 This is a beautiful Montblanc 146 sterling silver "Godron" pattern. Très beau Montblanc 146 argent massif motif "Godron". Excellent état. Pas de choc. Pas d'usure des parties dorées. 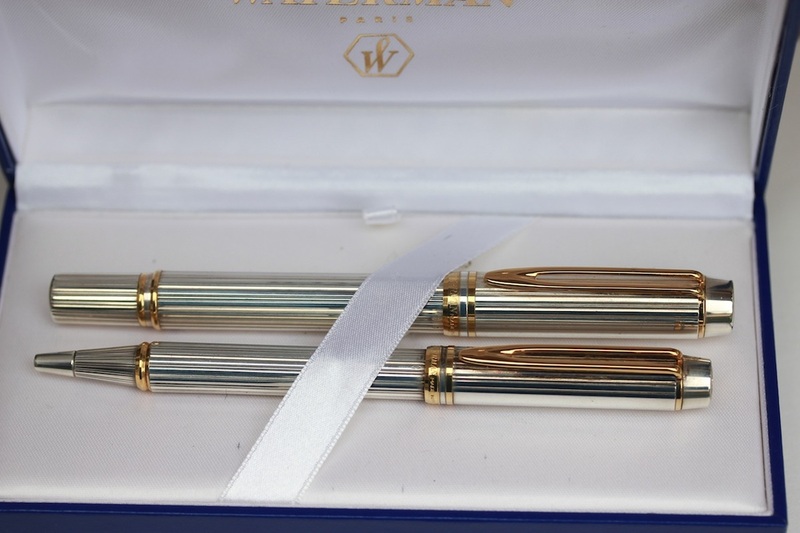 Beautiful Waterman MAN 100 set made for AIR FRANCE airline company. Fountain pen and Ball pen. Excellent condition. Near mint. Waterman box. Superbe set Waterman MAN 100 produit pour la compagnie aérienne AIR FRANCE. Stylo plume et Stylo bille. Excellent état. Comme neuf. Boite Waterman. This is certainly the most beautiful Man 100 Patrician, and the most sought after. This one is absolutely MINT. Certainement le plus beau des Man 100 Patrician, et le plus recherché. 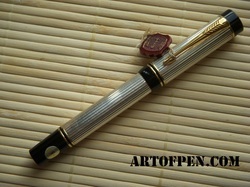 This is the very nice Waterman MAN 100 Opera. Black with a chasing reminding the first Waterman's. Très élégant Waterman MAN 100 Opera. Noir et ciselé à la façon des tous premiers Waterman's. Pas d'usure. Pas de choc. Nib: "HM Smith & Co NEW YORK N°1"
The dip pen is made of twist turned pearl with a nice gold plated wire. Plume: "HM Smith & Co NEW YORK N°1"
Le porte plume est en nacre tournée avec un fil d'or (plaqué or) enroulé. Très joli travail. 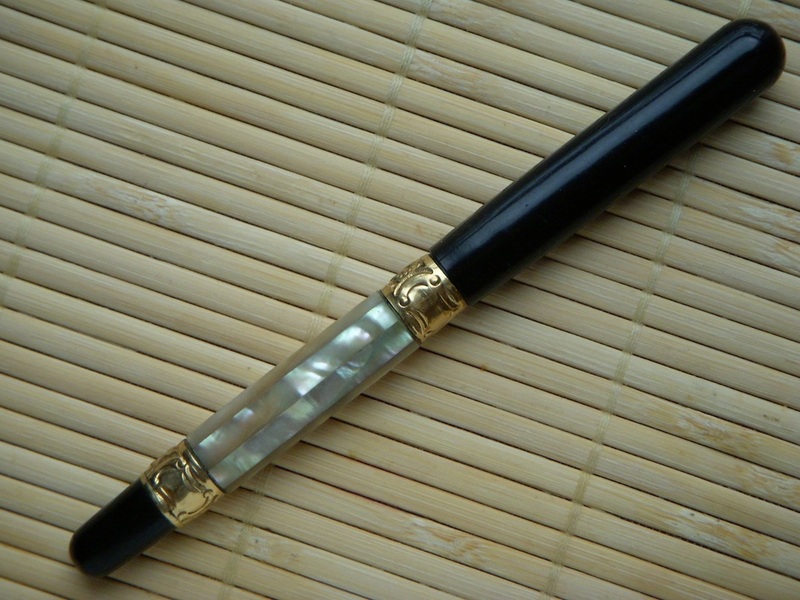 This is the same pen used by the famous french writer Colette. See picture below.Rare in this shape. One cap band version and "lucky curve" feed. Near mint condition. Excellent color, excellent imprint, excellent top of cap and barrel, light brassing on clip ball. 1920's when fountain pens were mainly black or red. Today this model is usually found in poor shape, with cracks or discolored. A good oportunity to buy a rare pen. The biggest pen of the line with a beautiful nib. This is the famous Parker Duofold Centenial made in the 1990's. 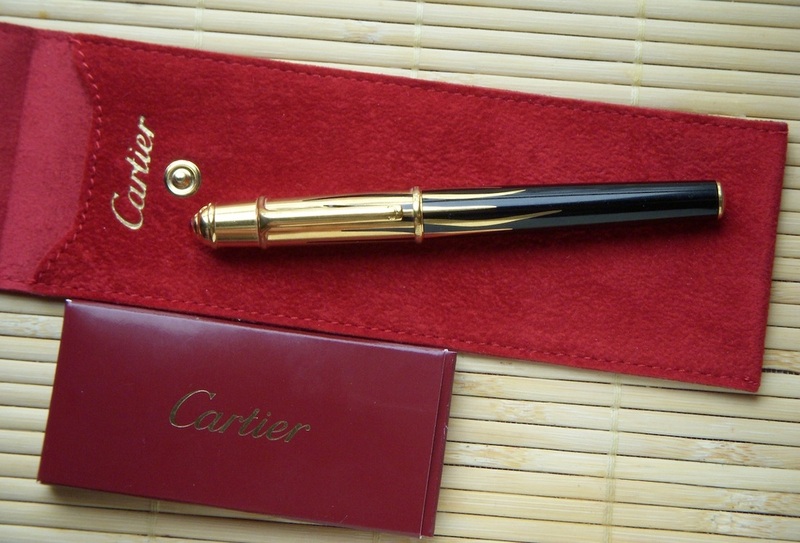 This pen still has his sticker (nib size : F) and "Parker Argent Massif) label on the clip. 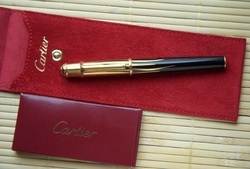 Very nice pen in great condition. 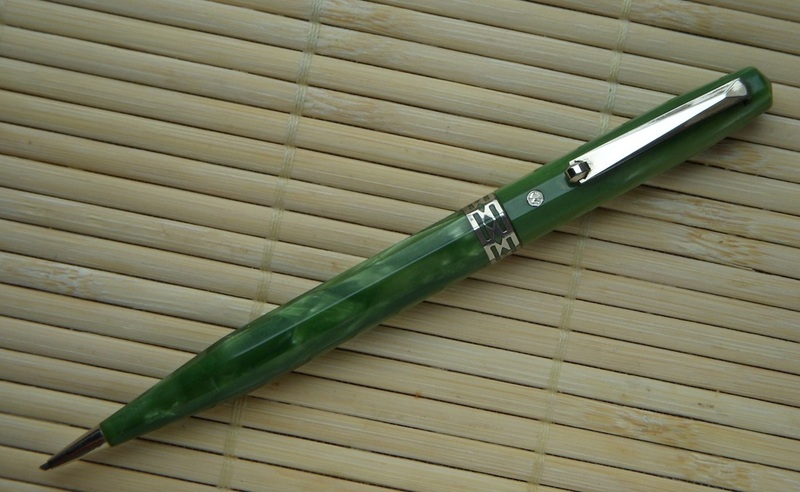 If you want to taste the pleasure to write with a vintage nib at low price, this is your man. This nib is flexible. A great pleasure to write with it. Nice Waterman 200 Rhapsody Red. This is a Doric pencil in the rare and nice Cathay color. 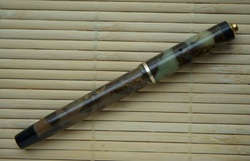 Interesting and nice fountain pen with abalone and gold filled rings on the barrel. Excellent condition except a "stress" on the cap but no crack at cap lip. Modern fountain pen of the famous french brand. Cardridge filler. Excellent condition. Some minor traces of use. Gold plated and lacque. Red stone on the top of the cap. Condition : Excellent shape. No brassing on clip, lever or cap band. The color is excellent except a little dark zone just over the clip (see pictures). The gold seal of the cap is drilled. This means that this pen didn't have a lifetime warranty. A really nice pen. 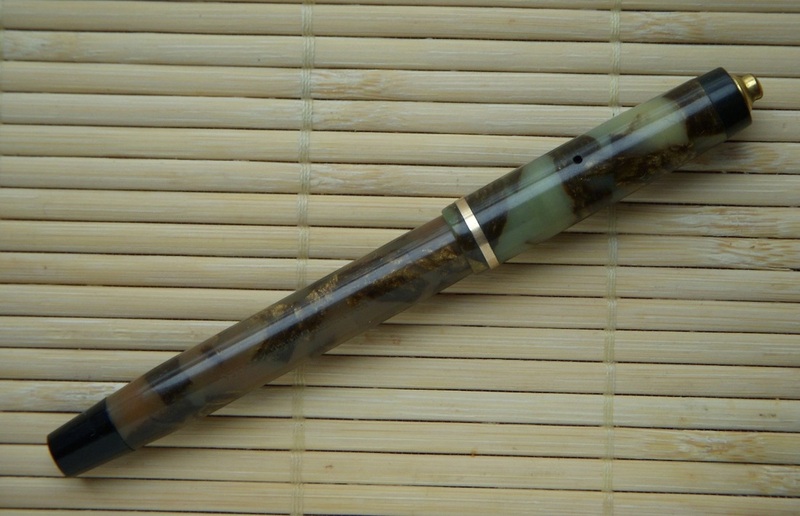 This Pilot is made of an incredible celluloid. A beautiful color with red, blue and gold. I have never seen this color before, i have been said it is quite rare. This is a lever filler. Gold plated clip and cap ring with no brassing. The nib is a Pilot Warranted 14k made in Japan. 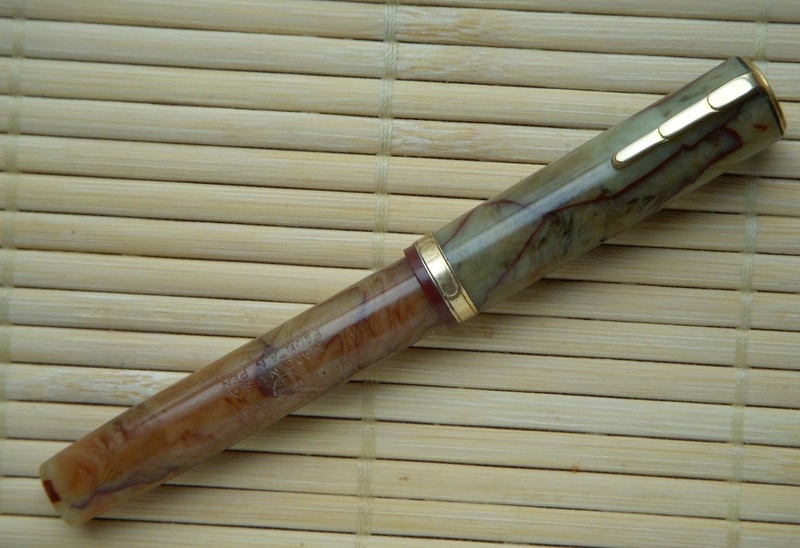 The pen has no sac to keep the colors of the celuloid intact. Barrel engraved : Pilot - The Pilot pen - made in Japan. Lightly worn but easily readable. Nice flexible Nib "Pilot Warranted 14k" N°4. This Lady Patricia is in very good shape. Color not perfect but still very nice. No brassing. Nice Waterman nib N°2. New sac installed. This is a very nice Parker depression in a rare color, cream and bronze. There is a difference of color between the barrel and the cap, but it is difficult to find in perfect color. This one is still very very nice. Ring top model. The ring is missing but can be easily replaced. The solid gold nib is original, engraved "Parker Pen Made in USA"
Perfect inscription on the barrel : "Geo S Parker PARKER Made in Usa"
This is a modern Montblanc roller ball. In excellent condition but with a little crack at the back of the barrel (see picture). Off course this is not a problem to use the pen and it is really hard to see. 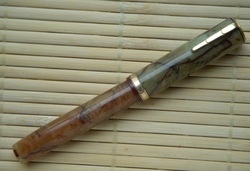 Lincold Pen oversize flat top in mottled hard rubber. Very good condition. Good imprint on barrel. Stunning Parker Lucky Curve Oversize - Pre Duofold ? I can only say this is a Parker Lucky Curve Senior in Excellent Shape. This is not a Duofold. The imprint on the Barrel indicates only "Lucky Curve". This is not a Jack Knife. No "Jack Knife" imprint on the cap (the cap is entirely chased). Excellent imprint and very crisp chasing. Lucky Curve nib N°5. Lucky Curve feed. Gold plated clip "Parker" with no brassing. Oversize pen : 13,7 cm with cap on. Button filler. This is a rare Waterman 15 sleeve filler. Rare for the filling system and rare for the size of the pen. Usually found in 12 size. The pen is big with a nice fine nib. The barrel ring is in perfect shape with no brassing or engraving. The barrel imprint is worn but still readable. The imprint on the top of the barrel is worn. Still a very nice and interesting pen. 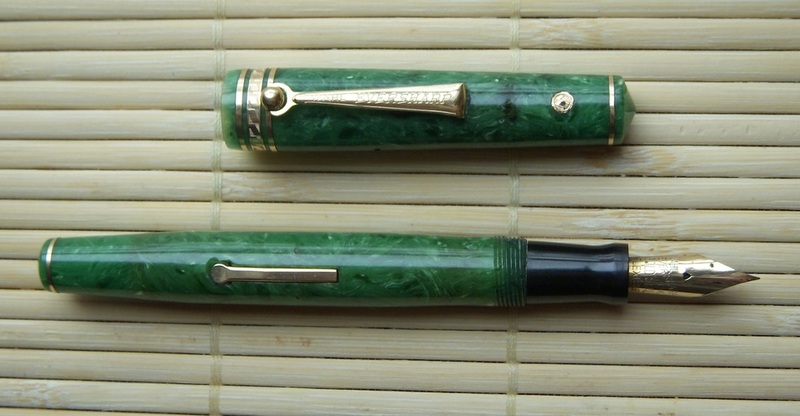 This is a set of Waterman 92 in Green and Bronze color. Very nice color for both pen and pencil. Light brassing on pen. The nib is nice and flexible. The pencil is in good working condition. 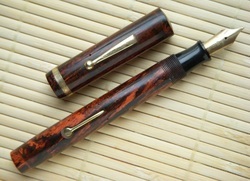 The 92 is certainly one of the most beautiful model made by Waterman's. "Green gray" color. Gold plated cap. Medium nib. Very nice condition. No brassing. Very nice Waterman 42 safety.Black and red hard rubber "Ripple". Two 18k solid gold rings on the barrel. Not restored but excellent condition. No crack. Excellent engraving. Excellent color. This pen is near mint. Used once. Very nice design. Excellent quality 18k gold nib. 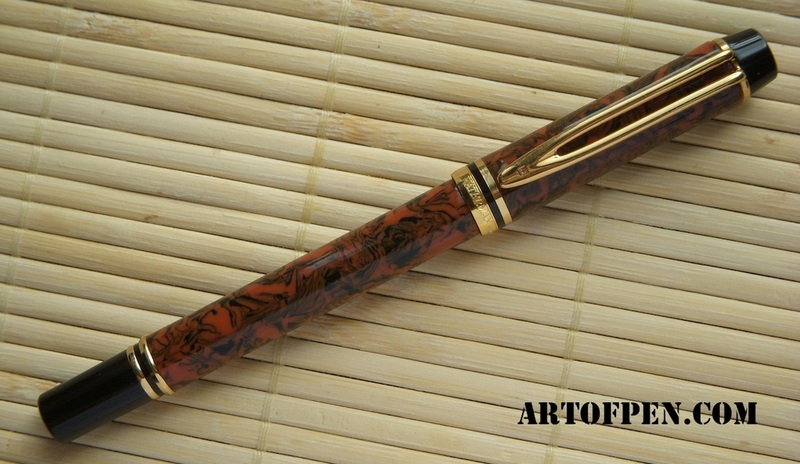 This is a beautiful example of the waterman 52 1/2V ripple. This pen is in really excellent condition. Near Mint ! Excellent color, engravings. No brassing. This is a very nice Eversharp pencil "pacemaker", brother of the "Coronet". Perfect engraving "UNITED STATES OF AMERICA" and "Genuine EVERSHARP Made in USA"
It has a nice decorated "sunburst" 3550 steel nib. The engraving on the barrel is perfect : "R Esterbrook H MADE IN USA"
This desk pen is in excellent shape. Very nice jade green color. Perfect engraving on the barrel. The Sheaffer Lifetime nib is original and in perfect shape. This is a rare Waterman in smooth solid gold. These pens are usually found with lots of dings. This one only have a little one near the top of the cap (see picture). Perfect black hard rubber with very nice inscription at the end of the barrel. 14k solid gold clip. Waterman ideal nib N°4. Name engraved on the barrel which indicates this was the pen of an american doctor (based on what i have found on the net). This is a rare Vacumatic Golden Web. Beautiful celluloid. The mecanism has been restored by a specialist. Very yellow gold nib. Pen in excellent shape except a stress at the cap lip very hard to see. See the close-up. A nice and interesting Vac ! This pen is in excellent shape. Beautiful color. Near Mint. No brassing. New sac installed. Original Parker nib. The Depression is a very interesting model made by Parker, with very nice materials. The Pen For Men in black with gold plated clip and cap band. No brassing. Excellent condition. Fantastic medium / broad nib with original ball extremity (quite rare). The pen has just been restored by a specialist. 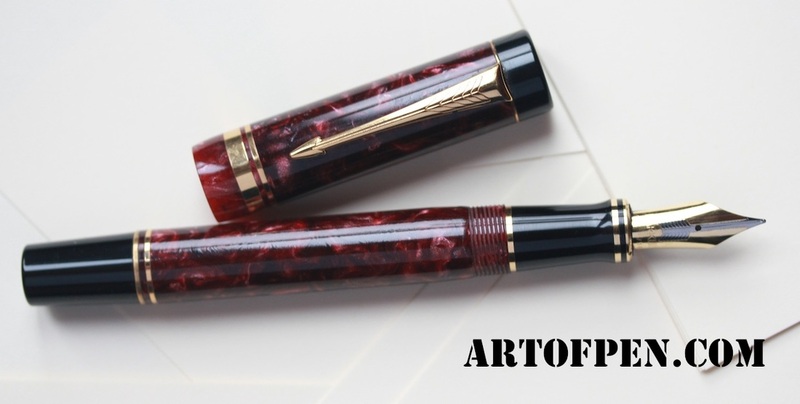 Beautiful fountain pen in limited edition. Material : Wood. Gold plated clip and rings. Two tones solid gold nib. The pen is Mint with the Box. No papers. 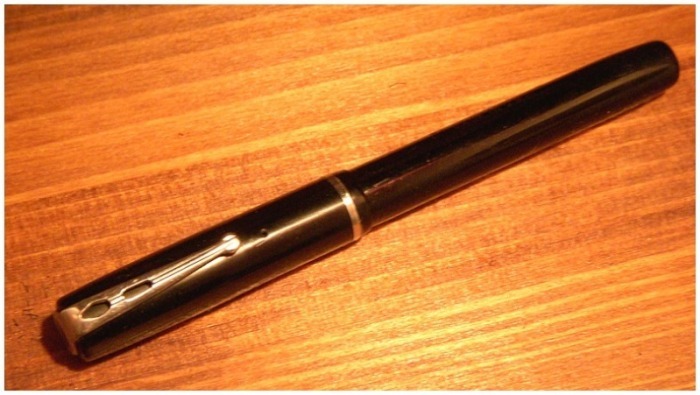 This is the bigger size of the Parker Vacumatic line (with the older Oversize). Excellent Shape. System in working condition. Big two tones nib with some discoloration of the white gold but still a very nice nib. No brassing. Nice arrow clip with "Parker" inscription and blue diamond. Very good brand engraving on barrel (see picture). Nice Oversize fountain pen. Identical to the famous Postal Pen. Same filling system. Nice mottled cap and barrel with a large ink window. There was certainly a logo or something missing here which was glued near the top of the cap, just over the clip. See picture. 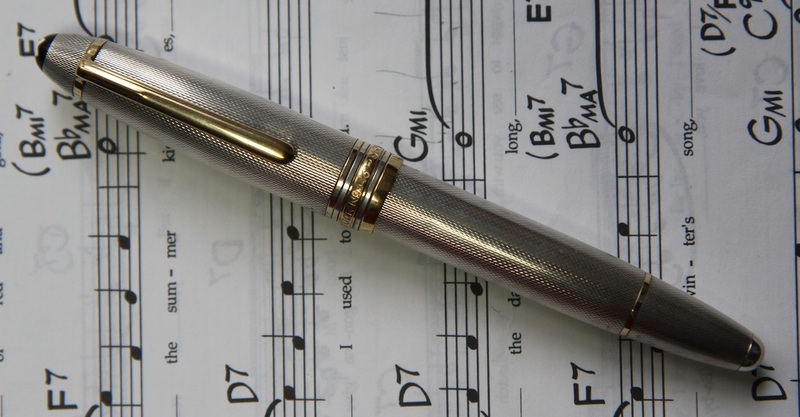 Fountain pen in fantastic shape. Near mint. Beautiful black color. No discoloration at all. Excellent chasing. Ring top. This is a nice Sheaffer Pen For Men V (PFM5). This is a famous pen from the 60's with one of the most interesting filling system called "Snorkel". Nice shape except a light ding (see the picture) on the top of the cap and some traces of use on the barrel. The filling system is working. Il s'agit d'un stylo célèbre des années 60 équipé de l'un des plus intéressant système de remplissage appelé "Snorkel". Très bon état excepté un léger choc (voir photo) sur le sommet du capuchon et quelque traces d'utilisation sur le corps. Le système de remplissage fonctionne.